You know it amazes me How us in the Uk with me and a few truther exceptions remain asleep whilst the Government systematically take away their freedoms right underneath their noses. Even when more things become general knowledge about the Government with child abuse scandals,money scandals,banking scandals , information on the wars in Iraq etc out in the open..people there was no reason to go to war..No weapons of mass destruction. People still do not see that they are gradually being able to do less and less..say less and less, speak up less and less,,conform conform conform..just do as we say and you will be OK..but ask anything about what we are doing and heaven help you. 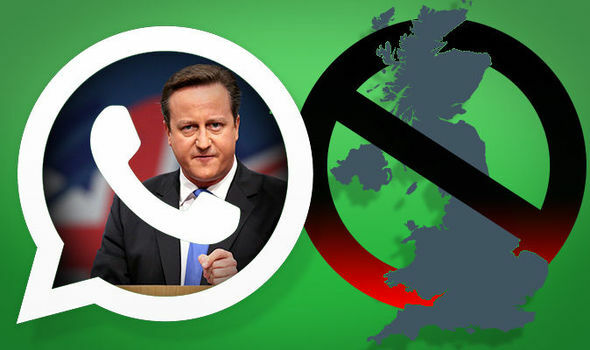 Now the United Kingdom in the almighty wisdom want to ban the mobile app whatsapp..why? because it is encrypted and they can not see what you are saying and keep up with what you are doing! Under the guess of protecting the country and under the new rules the government have bought in for safety..this is classed as unsafe…the snooper charter was blocked by the parliament originally but looks like its making a return..the last sentence in this whole article is the most important if you ask me..!!! Britons could see the hugely popular cross-platform app BANNED under strict new laws on social media and online messaging services. Prime Minister David Cameron is pressing ahead with new legislation that plans to stop people from sending any form of encrypted messages. A number of popular messaging services – including WhatsApp, iMessage and Snapchat – currently scramble communications between their users. If the controversial new legislation is passed in the coming weeks all three services could be outlawed in the United Kingdom. “In our country, do we want to allow a means of communication between people which we cannot read?” said Prime Minister Cameron earlier this year. The news comes weeks after WhatsApp was named one of the worst apps for user privacy. Private online communications will be opened-up by the Government’s “Snooper’s Charter” – or the Investigatory Powers Bill, to give the bill its full title – which requires internet service providers, phone companies and technology firms like Google, Apple, Facebook and WhatsApp keep a record of all of your activity. This troubling database of information, which will include all your Google searches, your Facebook conversations, WhatsApp group messages and SnapChat videos, will be made available to the UK police and Government whenever they require. Home Secretary Theresa May has warned the Investigatory Powers Bill could be passed this Autumn. The recent spate of terrorist attacks – including the shooting of 30 Britons on a beach in Tunisia – has prompted the Conservative Government to act fast. British police currently make a request to access personal metadata – texts, emails, phone calls and internet searches – once every two minutes in the UK, according to data from campign group Big Brother Watch. “We have always been able, on the authority of the Home Secretary, to sign a warrant and intercept a phone call, a mobile phone call or other media communications,” Mr Cameron added. The full extent of the powers granted by the Investigatory Powers Bill remain unclear. However, many have slammed the law as a breach of privacy. Executive director of The Open Rights Group Jim Killock said: “The Government is signalling that it wants to press ahead with increased powers of data collection and retention for the police and GCHQ – spying on everyone, whether suspected of a crime or not. Liberty – a group who campaign for civil liberties and human rights in the UK – added: “We take no issue with the use of intrusive surveillance powers per se – targeted surveillance can play an important part in preventing and detecting serious crime. Former Deputy Prime Minister Nick Clegg – who blocked the ‘Snoopers’ Charter’ while he was in power – also joined those speaking out against the Conservatives’ bill. He said: “We have every right to invade the privacy of terrorists and those we think want to do us harm, but we should not equate that with invading the privacy of every single person in the UK. They are not the same thing. “The so-called Snoopers’ Charter is not targeted. It’s not proportionate. “It’s not harmless. It would be a new and dramatic shift in the relationship between the state and the individual. And yet these are the same numskulls that are secretly – shusshh, whisper – trying to pass TTIP, TISA and TPP. Openess for the citizens but secrecy for the gang of dishonourable turds engaged in government. The West (US, UK, Spain, etc) must look at China and the Saud Family kingdom with envy, why can’t you just do as we say peasants? Its an existential joke. Another human has self -proclaimed the right to dictate how I should live. A clown-in-a-suit has issued a “law”: I must send him a copy of very letter I write otherwise another clown-in-a-blue-custom will arrest me – take away my liberty. Jokers! They are batsh#t scared of their own citizens rejecting their legitimacy and hence their “entitled” monopolized status. Oh? You think only Bush 2.0, the pope and royalty speak to God and do his work?